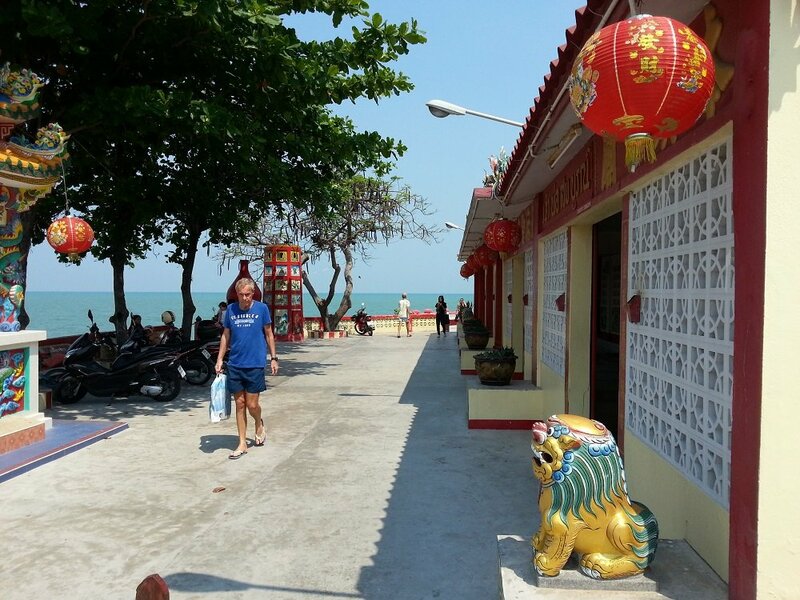 Overlooking the city centre beach in Hua Hin, Sai Nam Kheo Shrine is a small but beautiful Chinese style temple on the seafront. It is free to visit and open every day from 06:00 to 18:00. It is very close to the centre of town. The is distance by walking to Sai Nam Kheo is 400 metres from Buffalo Bill’s Hua Hin, 1 km from Hua Hin Railway Station, and 1.1 km from Hua Hin Night Market. The Chinese style artwork on the shrine and in the nearby Prayer Hall is colourful and detailed. 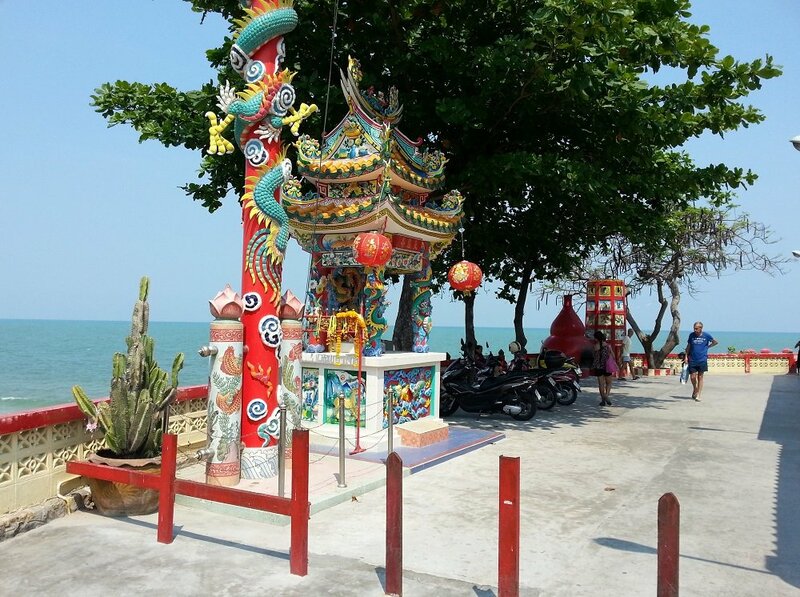 Sai Nam Kheo Shrine is built on rocky outcrop on the shoreline which provides excellent views the coastline with the wooden fish pier to one side and Hua Hin City Centre beach to the other. 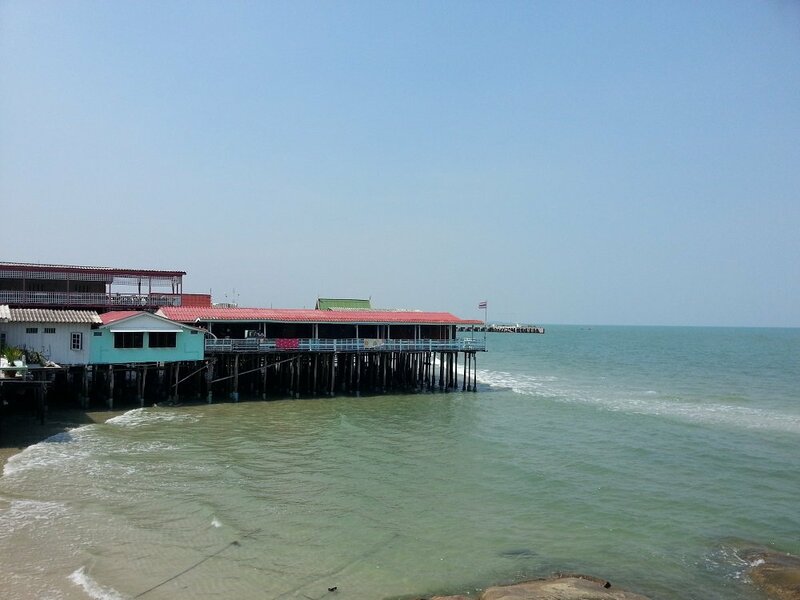 Cheap: Along the narrow road leading from the Naret Damri Alley to the Sai Nam Kheo Shrine there is small cafe in one of the Chinese style wooden fronted shops with tables along the side wall. The very pleasant lady who runs this establishment sells a range of drink and food including draft Chang beer at 50 THB a glass which is very refreshing after an hour or two walking around. Expensive: Follow the coastal path southward and walk a short distance across the sand to Chay Had Restaurant, which the pool bar for the Hua Hin Hilton. You can get very good quality food, drink and service here but it costs a lot more.